The Portland restaurant's twin brother-owners know their way around a smoker. There was no dessert on the menu when I visited Noble Barbecue in Portland last week, so I did what any reasonable person would: I ordered an extra pastrami sandwich. “For after,” I laughingly told my two dinner guests, when our server brought it to the table on a paper-lined, aluminum quarter-sheet pan. BOTTOM LINE: Ask Ryan Carey – who, along with his twin brother Richard, is one of the co-owners of Portland’s Noble Barbecue – about the type of barbecue he makes, and he balks. “We’re not really sticking with a certain style,” he said. “There’s Memphis, some Carolina, some Kansas City in there. For us, it’s a positive, because it means we can do anything we want.” He’s got a point. 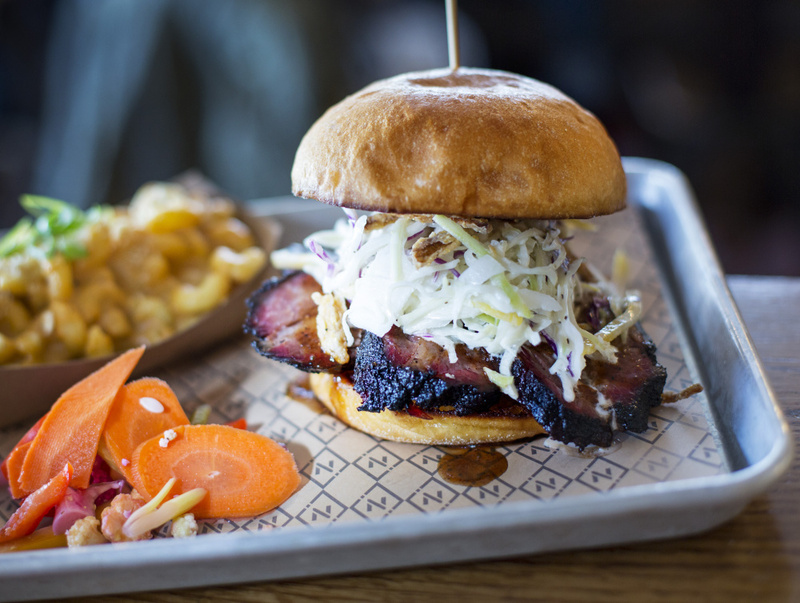 The culinary freedom Noble allows itself creates the space for a menu where a terrific, Texas-style smoked brisket can live happily alongside a New York pastrami or a wacky, yet completely addictive smoked spaghetti squash sandwich. A few dishes, like under-seasoned cubed pork and overcooked fries, need a tweak or two, but they are the exception, not the rule at Noble. 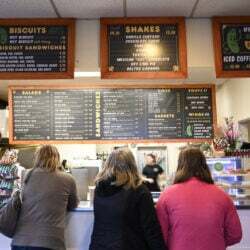 Most, like macaroni and cheese prepared to order, are inventive and well-executed – way beyond the quality of anything you’d have any right to expect from a BBQ sandwich shop in Maine, of all places. But we couldn’t wait quite that long, despite having ordered three other sandwiches. I learned quickly that Noble’s food is hard, maybe even impossible, to resist, especially when it is sitting right in front of you. So we dug in, using the disposable wooden cutlery at the table to slice through the toasted rye from Southside Bakery in South Portland, taking extra care not to lose a single flake of meat. 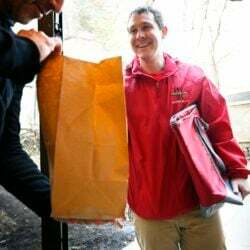 I knew he was telling the truth, because earlier that week, I had spotted him with his twin brother, co-owner/general manager Richard Carey, bouncing around the kitchen and greeting guests with contagious, Cheshire cat grins. The Carey brothers are visibly proud of their grill skills, and rightfully so. If the pastrami wasn’t enough to convince me, then the smoky beef brisket certainly did. My guests and I ordered it as part of a teetering sandwich ($12), layered into a brioche bun amid fried onions and discs of dill pickle. 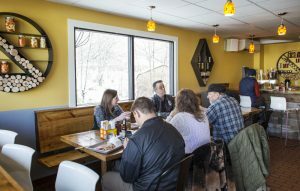 Most impressive was the variety of slices Noble includes in the sandwich – some from the fatty end and some from the lean end of the 141/2-hour-smoked brisket – so that each bite offers fat and meat in slightly different proportion. 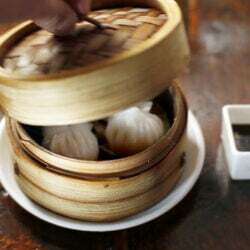 Then, once in a while, a spark of flavor from darkly shellacked flecks of “bark,” the caramelized, crusty exterior of well-barbecued meat. Eating the sandwich was like listening to the kinetic key changes of a jazz improvisation. The pair weren’t planning to open a restaurant, but when they went searching for a prep kitchen, they discovered the former Taco Trio space on outer Forest Avenue. “Unbeknownst to me, it was zoned so that if we wanted it, and we did, we had to use it as a restaurant,” Ryan Carey said. So they nailed rough-sawn wood cladding over the counters, added tables – 22 seats in total, including a long, standing-room-only six-top that runs down the equator of the dining room – and installed a bar that serves beer and wine. And just like that, the Careys went from catering weddings to serving lunch and dinner every day. 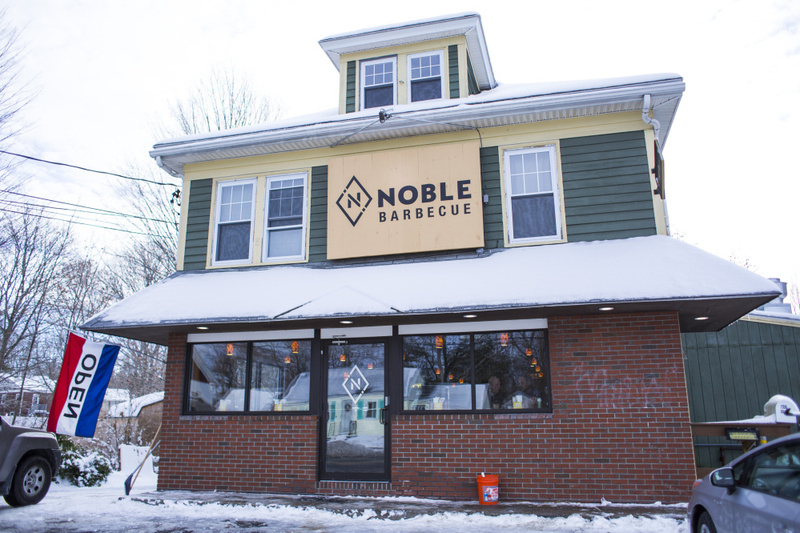 Noble Barbecue is in the building on outer Forest Avenue in Portland formerly occupied by Taco Trio. While it has largely been smooth sailing since the restaurant opened in mid-July, a few dishes on the menu illustrate that Noble does still hit an occasional choppy patch. French fries ($4), made from Maine potatoes that have been double-fried, are too crunchy, with a sticky, dry interior. The chopped pork shoulder sandwich ($9) is a surprisingly dull dish that demands extra squirts of the yellow, mustard-based Carolina barbecue sauce to liven it up. On one recent visit, I pulled out cubes of meat and tasted them on their own, away from the red-cabbage-heavy apple slaw, and could taste neither the paprika-based house rub, nor almost any flavor at all despite eight and a half hours in the smoker. The restaurant seats 22 and has a bar serving beer and wine. It’s quite a contrast to the vegetarian entrée option, a spaghetti squash sandwich ($11) that takes on so much smoke flavor that it could pass for an exotic cut of meat. Indeed, the kitchen shreds the squash so that its strands pull away into fibers not dissimilar to pulled pork. When an order comes in, they sear a patty made from the squash threads on the flattop grill, then brush it with a little pimiento cheese spread and top it with fried bread-and-butter pickles and tomato jam. It’s a superb vegetarian sandwich – a creative upgrade from the typical brown-rice-and-bean burger. Better yet, because of its magnificent messiness, even herbivores can enjoy the experience of sacrificing a favorite shirt to barbecue. Less sloppy but every bit as good, Noble’s macaroni and cheese ($4) is also an ingenious twist on a familiar concept. Rather than pre-batch mac-and-cheese and store it in the fridge, the kitchen boils a fresh batch of cavatappi noodles to a perfect al dente every time an order comes in, then flashes them in a pan with sharp, creamy four-cheese sauce. The resulting dish has more in common with an alfredo pasta than goopy, overcooked elbow noodles. “We tried doing it ahead when we first started, but it was just bad. Now that it’s never sitting around, it’s a different thing,” Ryan Carey said. As my guests and I passed the recycled paper bowl of mac-and-cheese back and forth, a woman at the next table tapped me on the shoulder with the handle of her fork. “What’s that you’re eating there? You seem to be enjoying it,” she inquired. When I told her, she pointed out that we had ordered a lot of food and asked, “Did you happen to see anything sweet when you were up there?” No, still no desserts. According to Ryan Carey, Noble has been experimenting recently with whoopie pies, made from the twins’ mother’s recipe, but they have not yet been added to the permanent menu. In the meantime though, there’s always pastrami.